We’d love your help. Let us know what’s wrong with this preview of Twilight Director's Notebook by Catherine Hardwicke. A personal, behind-the-scenes look at the making of the blockbuster film Twilight from groundbreaking director Catherine Hardwicke! This intimate full-color "notebook", designed to replicate the one director Catherine Hardwicke kept on and off the set, takes you through the creative process that went into making Stephenie Meyer's breathtaking novel come alive on screen - fr A personal, behind-the-scenes look at the making of the blockbuster film Twilight from groundbreaking director Catherine Hardwicke! This intimate full-color "notebook", designed to replicate the one director Catherine Hardwicke kept on and off the set, takes you through the creative process that went into making Stephenie Meyer's breathtaking novel come alive on screen - from casting to costumes, stunts to story boards. With never-before-seen notes, sketches, and photographs taken directly from the visionary director's personal notebook, this book includes everything from her visual inspirations, to step-by-step breakdowns of action sequences, to a behind the scenes look at some of the most pivotal moments in the creation of the film, and much more. To ask other readers questions about Twilight Director's Notebook , please sign up. from where I can read it? Anne Granger I borrowed it from the library, so it is possible they have it in the library! How can you read a book online ? Before I start, let me clarify one thing here: I am not, and never will be, a Twilight fan. I have read all four books and watched three of the movies, and I have to admit that though the books are not necessarily as great as those teenage girls claim to be, the first Twilight movie does show a quality moviemaking. There, I said it. The first Twilight movie is superb. Which is the reason I got curious of this book, where the director Catherine Hardwicke compiles a huge stack of handwritten notes wi Before I start, let me clarify one thing here: I am not, and never will be, a Twilight fan. Which is the reason I got curious of this book, where the director Catherine Hardwicke compiles a huge stack of handwritten notes with a heap of pictures from the shoots and behind-the scenes. And voila, an amusing, and at times sentimental recollections of how the crew worked at their picturesque locations on the outskirts of Portland, OR. It is also interesting to note how oftentimes Bella's scenes have to be done by a double because the actress Kristen S. was still 17 during most of the shoot process. In most U.S. states, you can only work a maximum of six hours a day if you are below 18. This led the crew to throw a birthday party saying "Welcome to [Working] nights!". On the whole, this small-ish hardcover would be an interesting companion to watching the first movie. Unless of course, you don't like the movie either. And try listening to Twilight OST album while leafing thru the pages. Oh crap. Forget I said that. Now I'm sounding like a teenage girl too. I got this book as a gift from a friend and I loved it!! Let me start out by saying, that although I am a Twilight fan, and I have read the books, I am NOT the biggest fan in the world. And out of all the Twilight movies, the 1st one is definitely my favorite. It has a certain feel that is just not replicated anywhere else, not in the other 3 movies and not in other movies I've seen. All the diagonal shots, the cool tones, the small home-town feel, it was just magical. So, I was very excited to r I got this book as a gift from a friend and I loved it!! Let me start out by saying, that although I am a Twilight fan, and I have read the books, I am NOT the biggest fan in the world. And out of all the Twilight movies, the 1st one is definitely my favorite. It has a certain feel that is just not replicated anywhere else, not in the other 3 movies and not in other movies I've seen. All the diagonal shots, the cool tones, the small home-town feel, it was just magical. So, I was very excited to read this book. I read this book PAGE BY PAGE, Picture by picture and caption by caption. I really absorbed it. It was so much fun seeing how one of your favorite movies was made! You don't realize how wacky things are on set and how much work all this is. But Catherine Hardwicke is a genius. She really gets the artsy feel across, the magic of Twilight, like no other director. And I saw some imitation (or a sort of reverting to Twilight) in Breaking Dawn part 1, but it really doesn't come close. Catherine set the tone and it was perfect for the story. By reading this book you really get to see how her mind works to make all of that happen. I loved her hand-written notes, the silly humor, and the honesty in this book. I am so glad she made it. If you love the movies and the books, and if you are interested in how directors direct movies you should get this one. Plus, it is full with beautiful, artistic never before seen photos. Este é o primeiro livro de não-ficção lido este ano. "Crepúsculo:Caderno da Realizadora" foi-me oferecido por uma colega de escola à cerca de 3/4 anos. Este livro é fantástico, tem ilustrações incríveis e ficamos a conhecer todo o processo criativo que a realizadora Catherine Hardwicke teve durante a realização do filme "Crepúsculo". Ver como tudo foi feito é espectacular, conhecer os processos de filmagem, de construção das personagens, as suas roupas, o cabelo, os acessórios.... tudo isto leva Este é o primeiro livro de não-ficção lido este ano. Ver como tudo foi feito é espectacular, conhecer os processos de filmagem, de construção das personagens, as suas roupas, o cabelo, os acessórios.... tudo isto leva ao resultado final que vemos no filme e saber como tudo é feito é impressionante. I excited bought this from Borders on March 17 (while celebrating my 20th wedding anniversary!) My first impression? GEEZ! Could it be any smaller and still show photos? Typical 5×7 paperback novel size, thinner than most. Nice hardback cover, but you’ll break the spine trying to see Rob Pattinson’s face in both of the two-page spreads where Edward is faceless or headless. I bought it of course. They knew it was a sure thing for collections if nothing else but its also full of very cool photos, d I excited bought this from Borders on March 17 (while celebrating my 20th wedding anniversary!) My first impression? GEEZ! Could it be any smaller and still show photos? Typical 5×7 paperback novel size, thinner than most. Nice hardback cover, but you’ll break the spine trying to see Rob Pattinson’s face in both of the two-page spreads where Edward is faceless or headless. I bought it of course. They knew it was a sure thing for collections if nothing else but its also full of very cool photos, drawings, and journal notes. I’m just being blunt because I expected something the same size and quality as the movie guide from last fall. That photo book was absolutely perfect so this one had a pretty big shadow to overcome. Sadly, it didn’t. But thanks anyway Catherine. We loved your creative work and passion for Twilight. You will be missed and your notebook is a treasure. I love Twilight, and I thought the movie was great. Now, I've really enjoyed going through Catherine Hardwicke's journal. She is so passionate about making the movie, correctly, and she put so much hard work into it. First off, I absolutely love the drawings and the storyboard sketchings. They really gave me a new perspective on the behind-the-scenes of Twilight. The costume designs were awesome! I think they were my favorite part. I also really enjoyed reading about how they made the favorite s I love Twilight, and I thought the movie was great. Now, I've really enjoyed going through Catherine Hardwicke's journal. She is so passionate about making the movie, correctly, and she put so much hard work into it. First off, I absolutely love the drawings and the storyboard sketchings. They really gave me a new perspective on the behind-the-scenes of Twilight. The costume designs were awesome! I think they were my favorite part. I also really enjoyed reading about how they made the favorite scenes, how everything was placed, etc. All in all, it was a quick read into the movie world of Twilight. I recommend it to others who share the same passion about Twilight. My neighbor was cleaning out her garage and gave this book to me. Nice photos, but we've seen them already. Difficult to read as it is written in teeny tiny handwriting. Good for - the Twilight Fan. This book shows the making of the twilight movie. This includes all of the characters and how they went through make up clothing and hair. They also show how all the actors and actresses who were gonna play the vampires and how they got ready to make them look like actual vampires ( pale skin gold eyes sleepless but good looking ). This book also shows how they filmed the baseball scene and te costumes. Also this book shows how they filmed, what they say, the hardest scene of the whole movie, wh This book shows the making of the twilight movie. This includes all of the characters and how they went through make up clothing and hair. They also show how all the actors and actresses who were gonna play the vampires and how they got ready to make them look like actual vampires ( pale skin gold eyes sleepless but good looking ). This book also shows how they filmed the baseball scene and te costumes. Also this book shows how they filmed, what they say, the hardest scene of the whole movie, which is the fight scene. They had to do a lot of things to get this ready. Then lastly, is the car accident. Now keeping in mind that noone can actually hold a car from crashing in to them with one hand. So they had to dent the car before hand the place a foam around it. So when he pushes it, it will be easier and it will look real. Lots of pictures and graphics from Hardwicke's notebook. Inside look into the behind the scenes tricks used to create some of the special effects. I was not a fan of the movie, but a big fan of the book. There were parts of the movie (not from book) added that I didn't care for. This book gives you an inside look as to why the director added certain scenes, what she was trying to convey. This helped me get a better understanding. It's interesting in its self to see all that goes into shooting a Lots of pictures and graphics from Hardwicke's notebook. Inside look into the behind the scenes tricks used to create some of the special effects. I was rearranging my bookshelf, and somehow I always forget that I have this. I bought it after reading Twilight, like...seven years ago, when I used to like the series, but this little companion notebook by the director of the first movie. It's actually really cool, it has sketches and art boards, sketches of how the characters and places should look like, how they made some of the scenes, as well as cinematic aspects of the film, that are entertaining to see. I am interested in film-making after watching my daughter act in some films. For a while it ruined watching movies because you envision the camera and set instead of immersing yourself in the story. I read this before seeing Twilight but that just made watching the film more interesting. The filmmakers true love of the story also came through in this book. It was enjoyable! This book is very pretty and well presented and it was a nice way to spend an hour. But I didn't feel like a came away with much I didn't already know. Offers you a very slight look into directing a film. Storyboards and sketches scattered throughout but not much actual writing. One for the die hard Twilight fans. 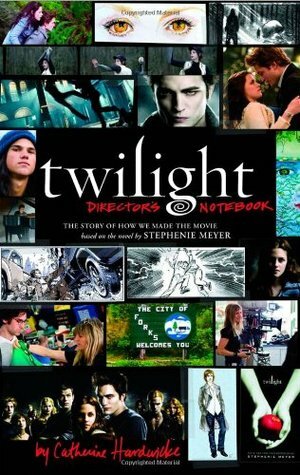 Twilight: Director’s Notebook, by Catherine Hardwicke, is an amazing behind the scenes look at the making of the first Twilight movie. This book was written by the director herself and includes many fun facts and details about how the movie was thought of, planned, and made that is sure to be a fun read to any Twilight fan. The book includes many amazing things like sketches of what the characters were thought to look like, the casting stories, images of scenes and how they were shot, and many other fun things. The book has a lot of pictures, which makes it a nice easy read for anyone looking for a relaxing and interesting book. One of the best things about the book is it has the directors thoughts in it, which are often quite hilarious. One of my favorite parts of the book was the story behind the casting of the character Carlisle Cullen because the actor who got the role, Peter Facinelli, wasn’t originally going to play the character but it ended up happening because of his funny lasting impression and it definitely wasn’t something I ever would have known or thought about when I was watching the movie without this book. A Catherine Hardwicke é a diretora mais fofa do século! Ninguém surta tanto pela própria cama como essa mulher surtou por causa de Robsten. É muito interessante ler os comentários dela, as curiosidades do set, todas as pesquisas que fez, imprevistos que enfrentou, objetos que a inspiraram a criar os cenários, etc. É um livro muito bacana pros fãs, bem como para qualquer pessoa que se interesse por essa carreira. I think this book was fantastic. It showed how the characters were originally designed and how they changed. It was very informative on how they made the movie and other stuff. I hope to get the notebook for all the other twilight books/movies. I randomly came across this in the library and decided, why not? This will make you appreciate just how much work goes into making a movie. I like that this director is really into the details, which is important when you're making a book into a movie. Definitely recommended for fans of Twilight. I actually really liked this! It's very cool to read the behind the scenes of a movie and Catherine Hardwicke was very dedicated to the making of the movie. I've read it twice now and it's just very informative for making a movie and other things. I have mixed feelings about the Twilight Saga, but this book was a lot of fun. I loved learning about the moviemaking process. I can relate to Catherine's creative passion and attention to detail. It really resonated with me. An enjoyable read during a rainy afternoon! A little short but cool! So many details I never saw on the movie I found them here. Not only about the movie itself but as a directors vision and "talk" is a good book. Not as informative as it probably should be. Not completely terrible though. Twilight is still trash. Catherine Hardwicke (born Helen Catherine Hardwicke; October 21, 1955) is an American production designer and film director. Her works include the independent film Thirteen, the Biblically-themed The Nativity Story, and the vampire film Twilight. Hardwicke was born in Cameron, Texas, the daughter of Jamee Elberta (née Bennett) and John Benjamin Hardwicke. She grew up in McAllen, Texas and is a Chr Catherine Hardwicke (born Helen Catherine Hardwicke; October 21, 1955) is an American production designer and film director. Her works include the independent film Thirteen, the Biblically-themed The Nativity Story, and the vampire film Twilight.